Kristin Chenoweth, MainArtist - Stephen Oremus, Conductor, Recording Arranger, AssociatedPerformer - Frank Filipetti, Engineer, StudioPersonnel - Stephen Schwartz, Producer, ComposerLyricist - Justin Shturtz, Asst. Recording Engineer, StudioPersonnel - Christian Hebel, Concertmaster, AssociatedPerformer - Alex Lacamoire, Conductor, Assistant Conductor, Recording Arranger, AssociatedPerformer - Sean McCourt, MainArtist - Cristy Candler, MainArtist - Jan Neuberger, MainArtist - Jason Spears, Asst. Recording Engineer, StudioPersonnel Copyright : ℗ 2003 Universal Classics Group, a Division of UMG Recordings Inc.
Kristin Chenoweth, MainArtist - Stephen Oremus, Conductor, Recording Arranger, AssociatedPerformer - Frank Filipetti, Engineer, StudioPersonnel - Stephen Schwartz, Producer, ComposerLyricist - Justin Shturtz, Asst. Recording Engineer, StudioPersonnel - Christian Hebel, Concertmaster, AssociatedPerformer - Alex Lacamoire, Conductor, Assistant Conductor, Recording Arranger, AssociatedPerformer - Jason Spears, Asst. Recording Engineer, StudioPersonnel Copyright : ℗ 2003 Universal Classics Group, a Division of UMG Recordings Inc.
Stephen Oremus, Conductor, Recording Arranger, AssociatedPerformer - Idina Menzel, MainArtist - Frank Filipetti, Engineer, StudioPersonnel - Stephen Schwartz, Producer, ComposerLyricist - Justin Shturtz, Asst. Recording Engineer, StudioPersonnel - Christian Hebel, Concertmaster, AssociatedPerformer - Alex Lacamoire, Conductor, Assistant Conductor, Recording Arranger, AssociatedPerformer - Carole Shelley, MainArtist - Jason Spears, Asst. Recording Engineer, StudioPersonnel Copyright : ℗ 2003 Universal Classics Group, a Division of UMG Recordings Inc.
4 What Is This Feeling? 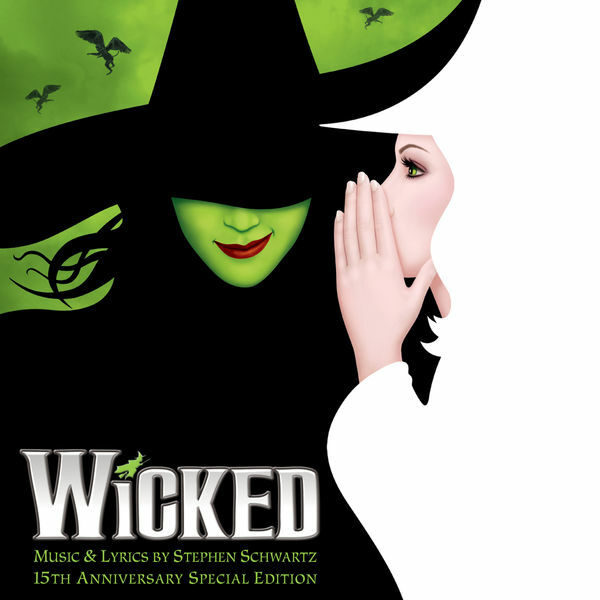 Kristin Chenoweth, MainArtist - Stephen Oremus, Conductor, Recording Arranger, AssociatedPerformer - Idina Menzel, MainArtist - Frank Filipetti, Engineer, StudioPersonnel - Stephen Schwartz, Producer, ComposerLyricist - Justin Shturtz, Asst. Recording Engineer, StudioPersonnel - Christian Hebel, Concertmaster, AssociatedPerformer - Alex Lacamoire, Conductor, Assistant Conductor, Recording Arranger, AssociatedPerformer - Jason Spears, Asst. Recording Engineer, StudioPersonnel Copyright : ℗ 2003 Universal Classics Group, a Division of UMG Recordings Inc.
Stephen Oremus, Conductor, Recording Arranger, AssociatedPerformer - Idina Menzel, MainArtist - Frank Filipetti, Engineer, StudioPersonnel - Stephen Schwartz, Producer, ComposerLyricist - Justin Shturtz, Asst. Recording Engineer, StudioPersonnel - Christian Hebel, Concertmaster, AssociatedPerformer - Alex Lacamoire, Conductor, Assistant Conductor, Recording Arranger, AssociatedPerformer - William Youmans, MainArtist - Jason Spears, Asst. Recording Engineer, StudioPersonnel Copyright : ℗ 2003 Universal Classics Group, a Division of UMG Recordings Inc.
Norbert Leo Butz, MainArtist - Kristin Chenoweth, MainArtist - Stephen Oremus, Conductor, Recording Arranger, AssociatedPerformer - Idina Menzel, MainArtist - Frank Filipetti, Engineer, StudioPersonnel - Stephen Schwartz, Producer, ComposerLyricist - Justin Shturtz, Asst. Recording Engineer, StudioPersonnel - Christian Hebel, Concertmaster, AssociatedPerformer - Alex Lacamoire, Conductor, Assistant Conductor, Recording Arranger, AssociatedPerformer - Christopher Fitzgerald, MainArtist - Michelle Federer, MainArtist - Jason Spears, Asst. Recording Engineer, StudioPersonnel Copyright : ℗ 2003 Universal Classics Group, a Division of UMG Recordings Inc.
Stephen Oremus, Conductor, Recording Arranger, AssociatedPerformer - Idina Menzel, MainArtist - Frank Filipetti, Engineer, StudioPersonnel - Stephen Schwartz, Producer, ComposerLyricist - Justin Shturtz, Asst. Recording Engineer, StudioPersonnel - Christian Hebel, Concertmaster, AssociatedPerformer - Alex Lacamoire, Conductor, Assistant Conductor, Recording Arranger, AssociatedPerformer - Jason Spears, Asst. Recording Engineer, StudioPersonnel Copyright : ℗ 2003 Universal Classics Group, a Division of UMG Recordings Inc.
Joel Grey, MainArtist - Stephen Oremus, Conductor, Recording Arranger, AssociatedPerformer - Frank Filipetti, Engineer, StudioPersonnel - Stephen Schwartz, Producer, ComposerLyricist - Justin Shturtz, Asst. Recording Engineer, StudioPersonnel - Christian Hebel, Concertmaster, AssociatedPerformer - Alex Lacamoire, Conductor, Assistant Conductor, Recording Arranger, AssociatedPerformer - Jason Spears, Asst. Recording Engineer, StudioPersonnel Copyright : ℗ 2003 Universal Classics Group, a Division of UMG Recordings Inc.
Kristin Chenoweth, MainArtist - Stephen Oremus, Conductor, Recording Arranger, AssociatedPerformer - Frank Filipetti, Engineer, StudioPersonnel - Stephen Schwartz, Producer, ComposerLyricist - Justin Shturtz, Asst. Recording Engineer, StudioPersonnel - Christian Hebel, Concertmaster, AssociatedPerformer - Alex Lacamoire, Conductor, Assistant Conductor, Recording Arranger, AssociatedPerformer - Carole Shelley, MainArtist - Jason Spears, Asst. Recording Engineer, StudioPersonnel Copyright : ℗ 2003 Universal Classics Group, a Division of UMG Recordings Inc.
Joel Grey, MainArtist - Stephen Oremus, Conductor, Recording Arranger, AssociatedPerformer - Idina Menzel, MainArtist - Frank Filipetti, Engineer, StudioPersonnel - Stephen Schwartz, Producer, ComposerLyricist - Justin Shturtz, Asst. Recording Engineer, StudioPersonnel - Christian Hebel, Concertmaster, AssociatedPerformer - Alex Lacamoire, Conductor, Assistant Conductor, Recording Arranger, AssociatedPerformer - Jason Spears, Asst. Recording Engineer, StudioPersonnel Copyright : ℗ 2003 Universal Classics Group, a Division of UMG Recordings Inc.
Stephen Oremus, Conductor, Recording Arranger, AssociatedPerformer - Idina Menzel, MainArtist - Frank Filipetti, Engineer, StudioPersonnel - Stephen Schwartz, Producer, ComposerLyricist - Justin Shturtz, Asst. Recording Engineer, StudioPersonnel - Christian Hebel, Concertmaster, AssociatedPerformer - Alex Lacamoire, Conductor, Assistant Conductor, Recording Arranger, AssociatedPerformer - Leo Norbert Butz, MainArtist - Jason Spears, Asst. Recording Engineer, StudioPersonnel Copyright : ℗ 2003 Universal Classics Group, a Division of UMG Recordings Inc.
Stephen Oremus, Conductor, Recording Arranger, AssociatedPerformer - Frank Filipetti, Engineer, StudioPersonnel - Stephen Schwartz, Producer, ComposerLyricist - Justin Shturtz, Asst. Recording Engineer, StudioPersonnel - Christian Hebel, Concertmaster, AssociatedPerformer - Alex Lacamoire, Conductor, Assistant Conductor, Recording Arranger, AssociatedPerformer - Christopher Fitzgerald, MainArtist - Jason Spears, Asst. Recording Engineer, StudioPersonnel Copyright : ℗ 2003 Universal Classics Group, a Division of UMG Recordings Inc.
Kristin Chenoweth, Vocals, MainArtist, AssociatedPerformer - Stephen Oremus, Conductor, Choir Arranger, AssociatedPerformer - Julia Murney, Additional Vocals, AssociatedPerformer - Idina Menzel, Vocals, MainArtist, AssociatedPerformer - Kevin Reeves, Mastering Engineer, StudioPersonnel - Stephen Schwartz, ComposerLyricist - Sue Pelino, Mixer, StudioPersonnel - Mike Davis, Trombone, AssociatedPerformer - Matt Beck, Guitar, AssociatedPerformer - Michael Olatuja, Bass Guitar, AssociatedPerformer - Hiroko Taguchi, Violin, AssociatedPerformer - William David Brohn, Co-Arranger, AssociatedPerformer - Whitney Lagrange, Violin, AssociatedPerformer - Raul Agraz, Trumpet, AssociatedPerformer - Kara Lindsay, Additional Vocals, AssociatedPerformer - Jennifer Laura Thompson, Additional Vocals, AssociatedPerformer - Kendra Kassebaum, Additional Vocals, AssociatedPerformer - Jessica Vosk, Additional Vocals, AssociatedPerformer - Taylor Williams, Synthesizer Programming, AssociatedPerformer - Ben Butler, Guitar, AssociatedPerformer - Alex Lacamoire, Co-Arranger, Keyboards, AssociatedPerformer - Donna Vivino, Additional Vocals, AssociatedPerformer - Lilli Cooper, Additional Vocals, AssociatedPerformer - Seth Foster, Mastering Engineer, StudioPersonnel - Todd Low, Viola, AssociatedPerformer - Charles Pillow, Woodwinds, AssociatedPerformer - Jackie Burns, Additional Vocals, AssociatedPerformer - Caroline Bowman, Additional Vocals, AssociatedPerformer - Laurel Harris, Additional Vocals, AssociatedPerformer - Emily Mechler, Additional Vocals, AssociatedPerformer - Dave Mancuso, Percussion, AssociatedPerformer - Sean McDaniel, Drums, AssociatedPerformer - Adele Stein, Cello, AssociatedPerformer - Ben Cohn, Keyboards, AssociatedPerformer - Carrie St. Louis, Additional Vocals, AssociatedPerformer - Jennifer DiNoia, Additional Vocals, AssociatedPerformer - Dee Roscioli, Additional Vocals, AssociatedPerformer - Katie Adams, Additional Vocals, AssociatedPerformer - Amanda Jane Cooper, Additional Vocals, AssociatedPerformer - Kate Fahrner, Additional Vocals, AssociatedPerformer - Libby Servais, Additional Vocals, AssociatedPerformer - Laura Woyasz, Additional Vocals, AssociatedPerformer - Kimberlee Wertz, Contracting With - Ryan Schumer, Assistant Mixer, StudioPersonnel Copyright : A Decca Broadway compilation release; ℗ 2019 Universal Television LLC., under exclusive license to UMG Recordings, Inc.
Stephen Oremus, Conductor, Co-Arranger, AssociatedPerformer - Kevin Reeves, Mastering Engineer, StudioPersonnel - Stephen Schwartz, ComposerLyricist - Sue Pelino, Mixer, StudioPersonnel - Mike Davis, Trombone, AssociatedPerformer - Matt Beck, Guitar, AssociatedPerformer - Michael Olatuja, Bass Guitar, AssociatedPerformer - Hiroko Taguchi, Violin, AssociatedPerformer - William David Brohn, Co-Arranger, AssociatedPerformer - Whitney Lagrange, Violin, AssociatedPerformer - Raul Agraz, Trumpet, AssociatedPerformer - Taylor Williams, Synthesizer Programming, AssociatedPerformer - Ben Butler, Guitar, AssociatedPerformer - Alex Lacamoire, Co-Arranger, Keyboards, AssociatedPerformer - Seth Foster, Mastering Engineer, StudioPersonnel - Todd Low, Viola, AssociatedPerformer - Charles Pillow, Woodwinds, AssociatedPerformer - Pentatonix, MainArtist - Dave Mancuso, Percussion, AssociatedPerformer - Sean McDaniel, Drums, AssociatedPerformer - Adele Stein, Cello, AssociatedPerformer - Ben Cohn, Keyboards, AssociatedPerformer - Kimberlee Wertz, Contracting With - Ryan Schumer, Assistant Mixer, StudioPersonnel Copyright : A Decca Broadway compilation release; ℗ 2019 Universal Television LLC., under exclusive license to UMG Recordings, Inc.
Stephen Oremus, Conductor, Co-Arranger, AssociatedPerformer - Kevin Reeves, Mastering Engineer, StudioPersonnel - Stephen Schwartz, ComposerLyricist - Sue Pelino, Mixer, StudioPersonnel - Mike Davis, Trombone, AssociatedPerformer - Matt Beck, Guitar, AssociatedPerformer - Michael Olatuja, Bass Guitar, AssociatedPerformer - Hiroko Taguchi, Violin, AssociatedPerformer - Ariana Grande, MainArtist - William David Brohn, Co-Arranger, AssociatedPerformer - Whitney Lagrange, Violin, AssociatedPerformer - Raul Agraz, Trumpet, AssociatedPerformer - Taylor Williams, Synthesizer Programming, AssociatedPerformer - Ben Butler, Guitar, AssociatedPerformer - Alex Lacamoire, Co-Arranger, Keyboards, AssociatedPerformer - Seth Foster, Mastering Engineer, StudioPersonnel - Todd Low, Viola, AssociatedPerformer - Charles Pillow, Woodwinds, AssociatedPerformer - Dave Mancuso, Percussion, AssociatedPerformer - Sean McDaniel, Drums, AssociatedPerformer - Adele Stein, Cello, AssociatedPerformer - Ben Cohn, Keyboards, AssociatedPerformer - Kimberlee Wertz, Contracting With - Ryan Schumer, Assistant Mixer, StudioPersonnel Copyright : A Decca Broadway compilation release; ℗ 2019 Universal Television LLC., under exclusive license to UMG Recordings, Inc.
Adam Lambert, MainArtist - Stephen Oremus, Conductor, Co-Arranger, AssociatedPerformer - Kevin Reeves, Mastering Engineer, StudioPersonnel - Stephen Schwartz, ComposerLyricist - Sue Pelino, Mixer, StudioPersonnel - Mike Davis, Trombone, AssociatedPerformer - Matt Beck, Guitar, AssociatedPerformer - Ledisi, MainArtist - Michael Olatuja, Bass Guitar, AssociatedPerformer - Hiroko Taguchi, Violin, AssociatedPerformer - William David Brohn, Co-Arranger, AssociatedPerformer - Whitney Lagrange, Violin, AssociatedPerformer - Raul Agraz, Trumpet, AssociatedPerformer - Taylor Williams, Synthesizer Programming, AssociatedPerformer - Ben Butler, Guitar, AssociatedPerformer - Alex Lacamoire, Co-Arranger, Keyboards, AssociatedPerformer - Seth Foster, Mastering Engineer, StudioPersonnel - Todd Low, Viola, AssociatedPerformer - Charles Pillow, Woodwinds, AssociatedPerformer - Dave Mancuso, Percussion, AssociatedPerformer - Sean McDaniel, Drums, AssociatedPerformer - Adele Stein, Cello, AssociatedPerformer - Ben Cohn, Keyboards, AssociatedPerformer - Kimberlee Wertz, Contracting With - Ryan Schumer, Assistant Mixer, StudioPersonnel Copyright : A Decca Broadway compilation release; ℗ 2019 Universal Television LLC., under exclusive license to UMG Recordings, Inc.
A Decca Broadway compilation release; This Compilation ℗ 2019 UMG Recordings, Inc.